TS ICET 2019 Results/ Answer Key / Preliminary key/ Final Key /TS ICET Results/ TSICET 2019 Preliminary key Final Key: A common Entrance Test, designed as Integrated Common Entrance Test 2019(ICET 2019) will be conducted by the Kakatiya University for entry into the first year of M.B.A and M.C.A courses offered for the academic year 2019-2020 in the Telangana State on behalf of TSCHE. Telangana State Council for Higher Education, for this time, allotting various entrance examinations to different universities in the State has allotted ICET-2019 Entrance Test to KU. TS ICET Result 2019 is delayed and now will be announced on .. June 2019 on the official website of Telangana State Council for Higher Education (TSCHE) - icet.tsche.ac.in. 'Results will be announced on ..-06-2019’ read a notification released by TSCHE today. A total of 61,439 students had appeared for the Telangana State Integrated Common Entrance Test (TS ICET) 2019 which organized by Kakartiya University, Warangal on .. May 2019 in 60 centres in Telangana for candidates seeking admissions to M.B.A. and M.C.A. courses of all Universities in the state of Telangana and their affiliated colleges. The TS ICET Result 2019 was to be released today; however, now the candidates need to wait till Sunday, 10th June to get the Final Key and Entrance Test Results. 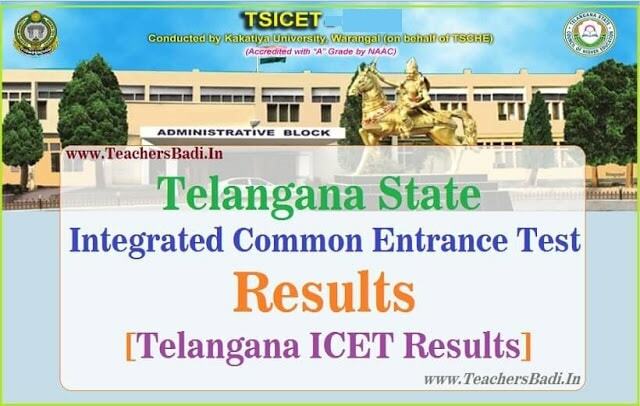 TS ICET Result 2019: The result of TS Integrated Common Entrance Test (ICET) has been released by the Telangana State Council of Higher Education, TSCHE, today on June .., on the official website icet.tsche.ac.in. All those candidates who had appeared for the same can check their result at the website itself. The exam was conducted by Kakatiya University, Warangal and a total of 61,439 students had appeared for the examination this year that was conducted on May .. at 60 centers across the state of Telangana. All the universities and the affiliated colleges in the state of Telangana will accept the test score. Telangana State Integrated Common Entrance Test (TSICET) is being held for admission to master levels professional courses like MBA and MCA of all the universities in Telangana State and their affiliated colleges for the academic year 2019-2020. The final answer keys and rank cards are now available on the website. The TS ICET 2019 certificate verification will also be delayed now and is expected to begin soon after the exam results are declared. As per the original schedule the verification process was to be continued till 10th July and Rank Cards were expected in the second week of June 2019, while counseling was scheduled to begin in first week of July 2019.However, due to this minor delay the Counseling and Seat Allotment Schedule may also take a hit. Kakatiya University Warangal issued the Telangana State Integrated Common Entrance Test (TS ICET)-2019 notification in February 2019 and the University invited online applications from the eligible candidates from March .. to April .., 2019. Applied candidates were appeared the entrance exam on ..-05-2019. Now, they are waiting for their results. Satavahana University, Karminagar, the CET committee Prof said that, TS ICET 2019 has been conducted peacefully in all announced 15 test centers and preliminary key will be released on May ... The results has been announced on May 30th. The results of TSICET 2019 has been uploaded on its website. Candidates can check their results from web portal https://icet.tsche.ac.in/. Any objections on the preliminary key may be submitted to the office of the Convener, TSICET-2019 through e-mail / Speed or Registered Post or in person on or before ...-05-2019 by 5.00 P.M.
TS ICET 2019 Result declared and Check them now at icet.tsche.ac.in: Telangana State Integrated Common Entrance Test (TS ICET) Result 2019 has been declared. The exam is conducted by Kakatiya University for admission to MBA and MCA programs at universities in Telangana and their affiliated institutes. This year TS ICET exam was conducted on May .., 2019. The result is available on the official website and students who appeared for the exam can check the same through their registration number or exam roll number. The University has already published the preliminary key for the exam and the result has been prepared according to the key published on the official website. How to check TS ICET Result 2019?/ TS ICET Result 2019: How to download rank card: The TS ICET 2019 results have been declared and the students may check their results following these steps: Step I: Go to TS ICET official website: https://icet.tsche.ac.in/; Step II Click on the result link for TS ICET 2019; Step III: Enter the required details. ; Step IV: Click on submit and view your result. After result declaration the process of counselling will begin. Counselling will be done on the basis of merit in the examination. The counselling schedule will be notified by competent authority in due time. TS ICET exam consisted of three sections - Analytical Ability, Mathematical Ability, and Communication Ability. The exam consisted of 200 questions which were to be solved in 150 minutes. Each question carried one mark. Every care is taken to avoid errors in the evaluation, checking, scrutiny, tabulation and ranking. Before applying for re-verification, download and check the OMR Answer Script, placed on website (https://icet.tsche.ac.in/). However, request for re-verification will be entertained on payment of Rs. 1,000/- by D.D. drawn in favour of the Convener, TSICET 2019 (payable at Warangal drawn on any Nationalized Bank),TSICET-2019 Hall ticket by speed/registered post on or before June ...., 2019 up to 5.00 p.m. After this date no request will be entertained. Step 4.In the TS ICET Results/ TS ICET Rank cards Page, Enter your Hall ticket number along with your date of birth in the required field.